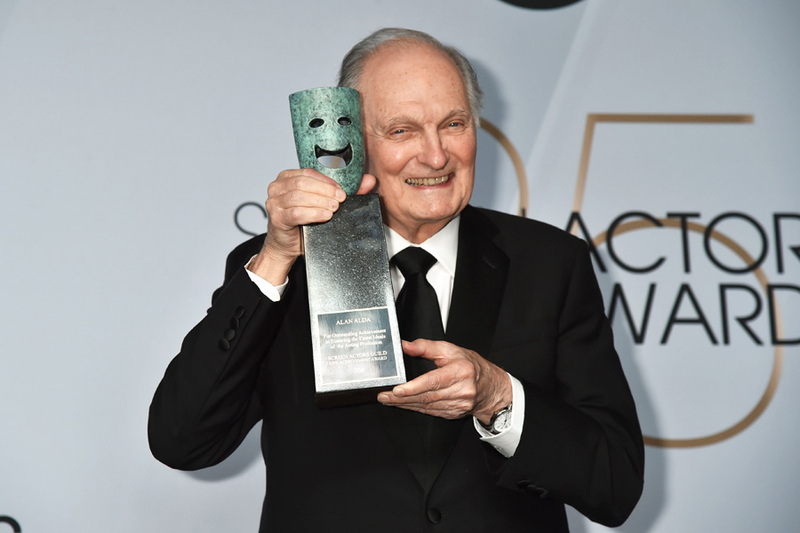 One day before his 84th birthday, screen legend Alan Alda stood before his peers and accepted the Lifetime Achievement Award at the 25th Screen Actors Guild Awards (SAG Awards). It’s a sentiment Alda discussed when we spoke ahead of his appearance at ideacity (a ZoomerMedia property) in 2017. Meanwhile, 71-year-old Glenn Close, fresh off a Golden Globe win earlier this month for playing the titular character in the film The Wife continued her award season run by picking up the SAG award for Outstanding Performance by a Female Actor in a Leading Role. The win marks Close’s second SAG award, which came 14 years after her first, prompting a speech that included the actress’ musing on the power of film in a world of screens. At the beginning of the broadcast, before the show’s host, Will & Grace star Megan Mullally, 60, took the stage, the opening segment of the show brought another touching scene. The camera, spotlighting different actors and actresses who discussed their vocation, stopped on Geoffrey Owens, the 57-year-old actor who played Huxtable son-in-law Elvin Tibideaux on The Cosby Show. In late 2018 a photo taken of him working at the California-based grocery store Trader Joe’s went viral after appearing on the Daily Mail website, sparking calls of “job shaming” against those who mocked him for no longer working as an actor. The resulting attention landed Owens a handful of new acting gigs and the opportunity to deliver his address, outfitted in a black tuxedo, at the SAG Awards. Owens followed Canuck comedy legend Mike Myers, 55, who used his moment to describe how he filled out a government of Canada vocational test when he was 17 and the results came back saying that his ideal vocation is a movie star. Elsewhere on the show, Canadian actress Sandra Oh, 47, won the award for Outstanding Performance by a Female Actor in a Drama Series (Killing Eve) and actor Rami Malek won the Outstanding Performance by a Male Actor in a Leading Role award for his portrayal of legendary Queen front man Freddie Mercury in Bohemian Rhapsody. Malek took some time in his acceptance speech to acknowledge the spirit of the man he embodied on the big screen. And Chadwick Boseman, who starred as the titular hero in Black Panther, closed out the night with one of the most memorable acceptance speeches of the show in accepting the award for Outstanding Performance by a Cast in a Motion Picture on behalf of the film. “Everyone knows that winning a SAG Award is the greatest honour an actor can win this weekend.” – host Megan Mullally in her opening monologue. “And to SAG nominee Emma Stone, who just turned 30, our condolences. But we’re looking forward to your reverse mortgage commercials.” – host Megan Mullally in her opening monologue. “The greatest honour of my life is to be nominated in the same category as Alan Arkin, who is an idol of mine and I think the reason I wanted to become an actor in the first place.” – Tony Shalhoub, 65, accepting the award for Outstanding Male Actor in a Comedy Series for The Marvelous Mrs. Maisel. “Thank you Robert Mueller and everyone working to ensure we have sovereignty for the United States of America.” – Patricia Arquette, 50, accepting the award for Outstanding Performance by a Female Actor in a Miniseries or Television Movie for Escape at Dannemora. “Thank you. This is reassuring.” – Jason Bateman, 50, accepting the award for Outstanding Performance by a Male Actor in a Drama Series for Ozark.